The temples are old, twelve centuries old in some cases. They are mossy, disordered, eroded, unsettled by roots and shifting sands, and sometimes riddled with bullet holes. They were lost to pilgrims and scholars alike until painfully recently, swallowed up by trees and climbing vines until they were unrecognizable. But they were not abandoned. Ain’t he cute? He’s not a spider, but a completely different type of arachnid also known as a whip spider. You may recognize him from one of the Harry Potter movies, or from a late-night freakout in which you likely jumped onto something as far from the floor as you could manage while maybe squealing or whimpering just… just a little bit. Fear not, gentle readers! Amblypygi are not venomous, aggressive, or even particularly defensive. For the most part they just hang out and eat crickets. Those long pedipalps (crabby-looking claws in the front) tell you whether the animal is a male or a female (males have longer ones, females shorter) and have the capability of grabbing on to little buggy snacks, but at their worst could give you a good pinch if you really tried to make their owner mad. The temples have been re-occupied by humans and restoration work (funded by Cambodians, the French, Indians, Russians, and Americans among others) is everywhere through the temple complexes. But the company that the temples have kept through the hundreds of years between creation, overgrowth, rediscovery, looting, and tourism refuses to give up its home. They live here now. It’s their temple too. Some of them even engage in restoration work of their own, contributing silvery adornments to the crumbling walls. 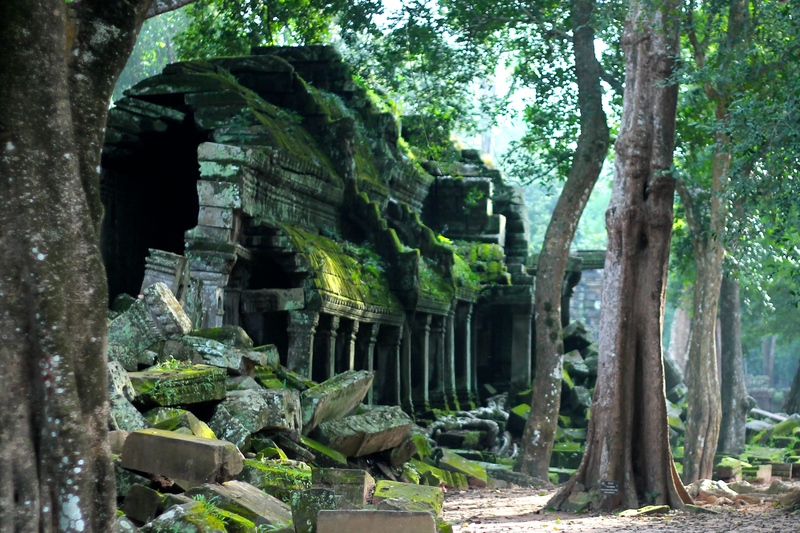 The temples have been reclaimed many times over their long history, by Hindus, Buddhists, Khmer Rouge, the French, modern-day Cambodians, and the forest itself. But I’d never call them abandoned. This entry was posted in Biology, Cambodia and Vietnam, Travel and tagged amblypygid, cambodia, millipede, photography, spider, spiderweb, ta prom, temple, travel, tree root, whip spider. I’ve read that the site has been heavily looted. Do you notice this there? And the pictures you’ve been taking are amazing! Yes, a lot of statues were missing heads and everything else was stripped down to bare stone. Anything that could be carried away has been carried away. But I guess we didn’t miss what we don’t know about? And the stone is still something else.